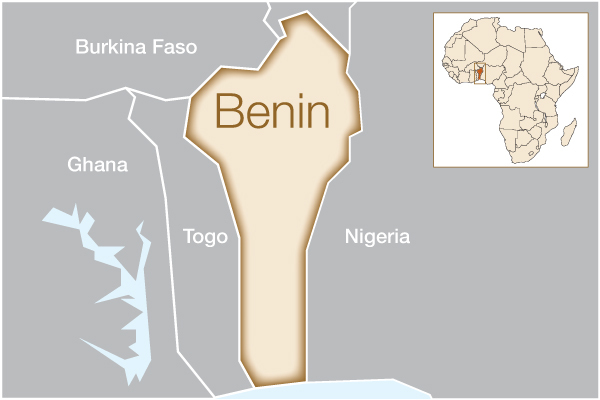 Why Do We Work in Benin? Formerly known as the African kingdom of Dahomey, Benin is the small West African country surrounded by Togo, Nigeria, Burkina Faso and Niger. Benin is one of Africa’s most stable democracies, but economically, it is seriously underdeveloped and corruption runs rampant throughout. It remains one of Africa’s largest producers of cotton but ranks among the poorest countries. Despite the relatively high percentage of births attended by a skilled health worker, maternal mortality has been slow to decrease. The World Health Organization (WHO) reports that each year 1,300 women in Benin die during childbirth, and for every woman who dies, an estimated 20 more suffer from postpartum complications, including obstetric fistula. The fact that the country’s maternal mortality ratio was even higher in previous years indicates a likely backlog of fistula cases in need of treatment. Other factors, including teenage pregnancy and a high fertility rate, also increase the risk of obstetric fistula. We provide grant support to this hospital through Women and Health Alliance International (WAHA). How will this help women in Benin? Funding from this grant will help provide treatment and care for 70 women suffering from obstetric fistula in the country. It will also allow for several community outreach activities to be carried out with intention to raise awareness about obstetric fistula, increase access to the necessary treatment and encourage and support the social acceptance of those afflicted with the condition. The grant will also cover any transportation costs for women who must travel great distances for fistula care.